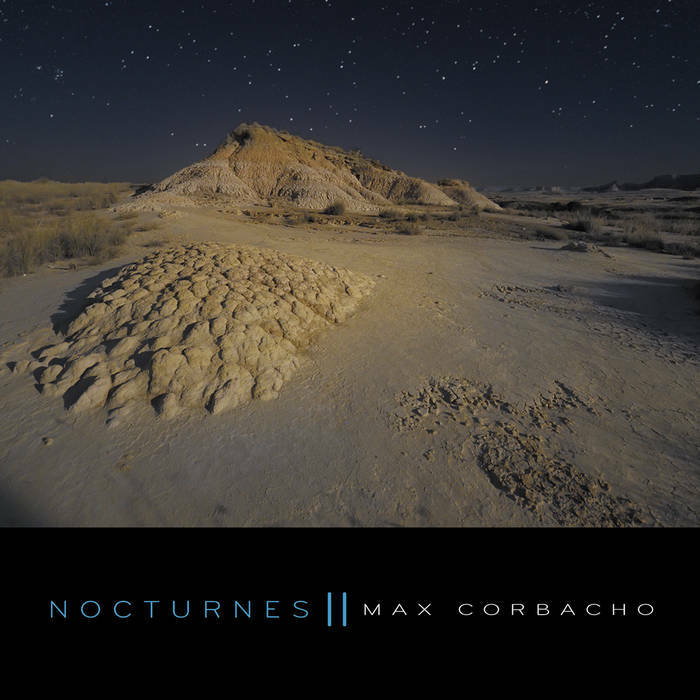 Welcome to another journey into the silky darkness of the night with Max Corbacho as he unleashes Nocturnes II for his fans to devour and enjoy. Nocturnes II was released on April 20, 2018 and from the first notes of Celistia which clocks in at a hefty 23:13 the listener knows that this is going to be a special journey that will leave them wishing for more when it finally comes to a close after the last track called Moon Apparition closes out the album. Nocturnes II to me encapsulates the slow breathing and mystical aspects of those darkest hours of the night when all is quiet in the world and the only thing that breaks that silence are the sounds of crickets, birds or animal calls as they wander the landscape when humans have retreated to the warmth of their beds until daylight once again returns the world to them. With Nocturnes II Max has created a soundscape that is shadow-encased but in a way that is inviting and urges us to step into the shadows ourselves not in a fearful way but in an intimate way by embracing the darkness that surrounds us at night. Max has outdone himself with Nocturnes II and has given us a masterpiece of music and sounds that will be played over and over again in the coming months. The lush quality of this music and the ethereal mindset that it puts the listener into are perfect for creating a relaxing atmosphere that is filled with deep, dark passages that are appropriate for some serious introspection and contemplation. According to the liner notes Max has woven into the fabric of this music crickets and other night sounds that he recorded live for inclusion in this project. Max has used these sounds in a subtle way to accent the music and to help create the deeper reality that one finds when sitting in the night and listening to the natural sounds that are only hints of what lies beyond our vision within the darkness that envelops us at night. Nocturnes II shows us that Max Corbacho is adept at crafting long ambient pieces that he expertly weaves into a cohesive work that carries the narrative forward from song to song. With variations and nuances Max is always able to move the listener forward deeper into a state of tranquility, deeper into the velvety darkness that is where the music on this album originated from. Max’s instincts in regards to the choice of music and the production and mixing of this album are impeccable. He shows us that he is an artist who knows his abilities and is more than capable of using his talents to craft a wonderful album like Nocturnes II. This album has 7 tracks and runs close to 70 minutes in length which is more than enough time to immerse yourself into the night that Max has presented to you on this album. If you were thinking about giving Max’s music a try then I would recommend that this album is a good place to start. The recording quality for this project was top notch and was a sonic delight to listen to. Nocturnes II is an enchanting work of art and a captivating narrative filled with shadowy and slow moving images created by Max’s expert usage of sequencing, synthesizers, samplers, looping devices and atmospheres. This album will give you a new appreciation for what these electronic devices can deliver when put into the hands of a skillful artist like Max Corbacho. Do yourself a favor and go get your own copy of this latest release by Max. Highly recommended by Ambient Visions.